With Valentine’s Day just two days away, we hope that you’ve got something romantic and truly special planned. 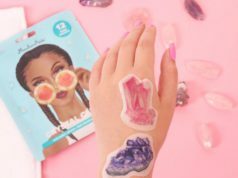 However, if you haven’t gotten yourself anything yet, now is the perfect time to spoil yourself, and with Tata Harper’s Exclusive Valentine’s Gift, you’ll look, feel and experience the true love and indulgence of Valentine’s day and the gorgeously scrumptious body care products that Tata has to offer! 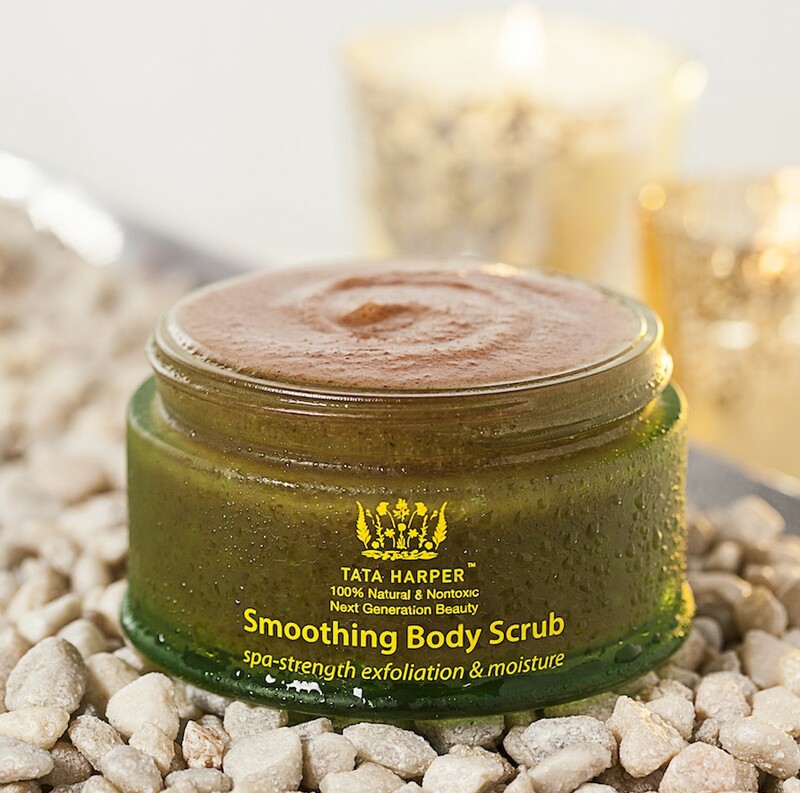 If you haven’t yet tried any of Tata Harper’s beauty and body products, you sure are missing out on the pure indulgence of their natural and gorgeously yummy products. 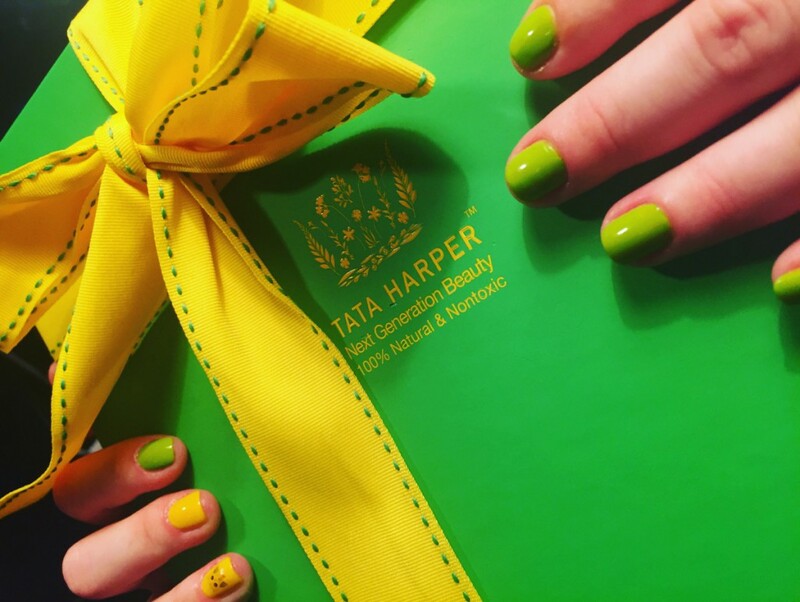 Tata Harper Exclusive Valentine’s Gift is the perfect way to taste a little bit of the Tata Harper heaven that is growing ever more popular by the day! 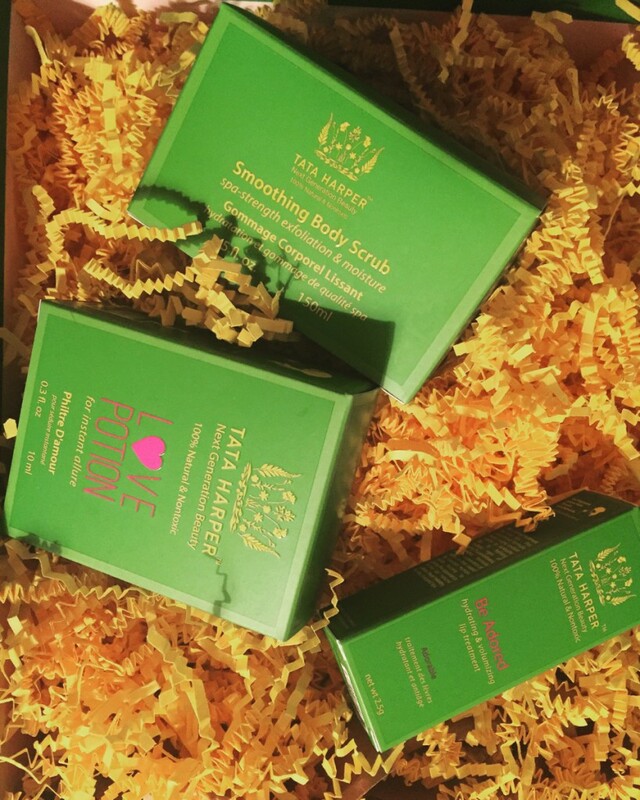 We are absolutely in love with their body products and cannot wait to tell you all about the awesomeness that we experienced with this Limited Edition Valentine’s Day Collection from Tata Harper. It will arrive at your doorstep wrapped up in a brightly and gorgeously green gift box, luxuriously wrapped up with a green and yellow ribbon – which definitely put us in a summery, spring mood, almost instantly! Enclosed in this beautifully wrapped gift box, are some of Tata Harper‘s most famous and award-winning products, including their Smoothing Body Scrub, Revitalizing Body Oil, Love Potion, Tata Harper Be Adorned Lip Treatment plus a deliciously scrummy tasting Lake Champlain Chocolate Bar! How much more perfect can Valentine’s day get than that?! The ultimate spoil ladies! This is a spa-strength exfoliation and moisture inducing body scrub, and we can see why it has been awarded two awards, including the Shape Magazine Beauty Award and the Best in Beauty Award from the Beauty Examiner! This Smoothing Body Scrub truly is the ultimate indulgence when it comes to body scrubs, and we can honestly say that this lush scrub will leave your skin feeling hydrated and exfoliated, and is guaranteed to leave your skin looking smoother, feeling softer and will ultimately leave it with a lovely glow! The results of this scrub on our skin was just divine and we would highly recommend it to all of our readers looking for a spoiling gift to themselves. Besides all the lush benefits this scrub has on your skin it’s also going to leave you smelling amazing, mostly because it includes ingredients like Cranberry fibers, Apricot Seed Powders, Hawaiian and Himalayan Sea Salts and of course Argan Oil…we are officially in love! It’s not often that we use a body oil that we actually love, most of them leave your skin feeling oil and don’t really absorb into the skin. BUT of course Tata Harper doesn’t disappoint, and how can we be surprised as this is yet another one of their award winning products having won a Beauty Examiner Award, and most recently the Nylon Beauty Hit List Award in 2015. We really and honestly were bowled over with this extremely fast-absorbing body oil, which has the most luxurious feel to it, and left our skin feeling as if it had been revitalized and invigorated with a boost of nutrition! 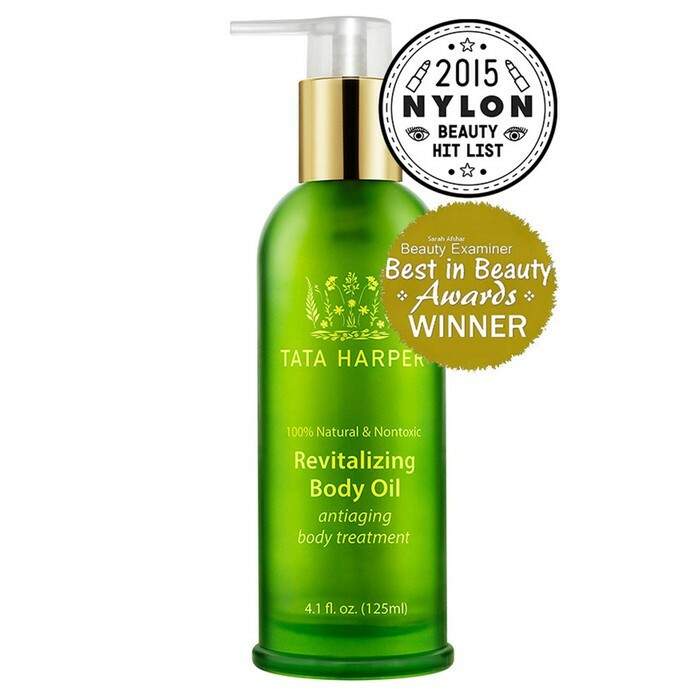 This Revitalizing Body Oil from Tata Harper, promises to give your skin a radiant appearance, which it really does! But without any excess oil and with the bucket load of minerals, essential vitamins, and nutrients in this body oil, we’ll definitely be using it every day, in the hopes of a younger and more revitalized looking skin! The absolute perfect lip colour for Valentine’s Day, and not only is it the perfect colour, it’s also going to make your lips look and feel like a million bucks! 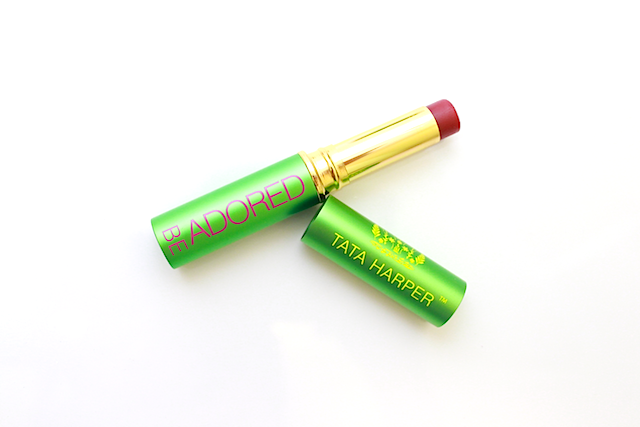 We are definitely in love with this Tata Harper Be Adored Lip Treatment, which gave our lips just the slightest rosy-red tint, but was super conditioning as well! We could literally feel the plumpness being restored into our lips with this luscious lip treatment, plus it’s going to soften up those cracked and wrinkly winter lips, getting your lips ready and fresh looking for Spring! We were super excited to hear that this lip treatment not only contains Date Palm extracts, which by the way will boost the collagen in your lips, naturally! But they’ve also included ingredients like Green Tea oils, Acai, Rhubarb and Spanish Lavender…seriously your lips are going to look fabulous…we promise! Not only is this Love Potion packed with Ylang Ylang, but it’s also swirling with Frankincense, Sandalwood, Davana, Grapefruit, Cedarwood and the powers from the flowers – Jasmine, Rose and Violet Leaf! There’s not a doubt in our minds that you’ll feel spectacular with this Love Potion spritzed on your skin!